Stocks were set to slump at Wednesday's open with investors considering a fresh batch of corporate results and economic reports. U.S. stock futures were lower ahead of the opening bell. Bank of America (BAC) posted higher first-quarter earnings of $2.6 billion, or 20 cents a share. Higher investment banking revenue was offset by lower mortgage banking income. Shares of Yahoo (YHOO) continued to slide, one day after the company reported lousy first-quarter sales and issued a downbeat outlook. Intel (INTC) shares edged lower in premarket trading as the chipmaker posted earnings and sales in line with expectations. The company reported another decline in chip sales for PCs, however, with revenue from that business falling 6% compared to a year earlier. Fairway Group Holdings, the parent of Fairway Market, priced an initial public offering at $13 a share -- above its estimated range. The company will start trading Wednesday under the ticker FWM. American Express (AXP) and eBay (EBAY) are due to report results after the close. In economic news, the Federal Reserve will release the April edition of its Beige Book, a survey of regional economies, at 2 p.m. ET. Gold prices slid $3 to $1,384.40 an ounce. 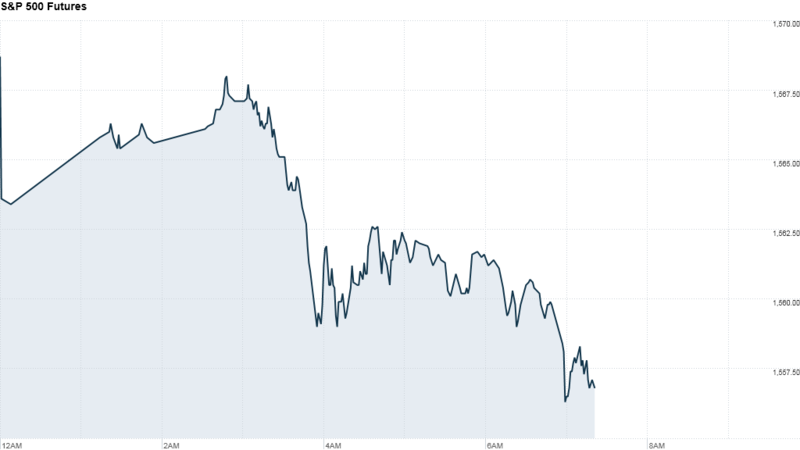 Prices had managed a modest recovery on Tuesday, a day after the biggest sell-off in decades. U.S. stocks rose Tuesday, bouncing back from the biggest one-day sell-off of the year amid concerns about global economic weakness and following the Boston terror attack. European markets were weaker in morning trading, dropping for a fourth consecutive session, while Asian markets ended mixed. The Nikkei added 1.2%, while the Shanghai Composite and Hang Seng were little changed.